Nikon Instruments has released the N-SIM S Super Resolution Microscope, which enables super-resolution imaging of live cells at ten-times the speed of conventional SIM. Powered at its core by the Eclipse Ti2-E Inverted Research Microscope, the N-SIM S offers advanced optics, superior stability and intelligent features. 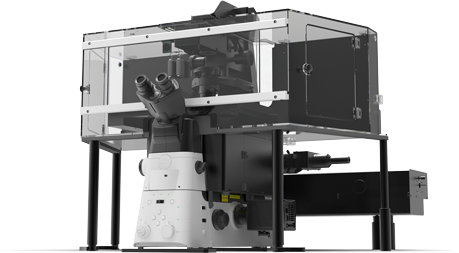 Using a high-speed structured illumination system, the N-SIM S achieves acquisition speeds up to 15 frames per second, enabling the acquisition of fast biological processes at twice the spatial resolution of conventional light microscopes, in multiple structured illumination modalities. The new microscope doubles the resolution of conventional optical microscopes (~115nm in 3D SIM mode) by combining Structured Illumination Microscopy technology licensed from UCSF with Nikon’s CFI Apo TIRF 100x oil objective lens (N.A. 1.49). The most recent optical designs using wavefront aberration measurement have been applied to yield excellent optical performance with the lowest asymmetric aberration. Nikon’s new high-speed structured illumination system uses a novel pattern modulation technology to generate fast and precise switching of illumination patterns. The N-SIM S microscope achieves acquisition speeds (up to 15 fps), enabling super-resolution time-lapse imaging of live cells and intracellular dynamics.